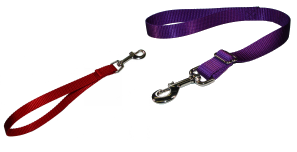 Nylon training and working leads in an assortment of colors. Available widths are 3/8in., 5/8in., 3/4in. and 1in. in lengths of 2in., 3in., 4', 5' and 6'. Need a special length, just give us a call. Perfect for total control on short trips. Available in standard, consisting of a nickle plated snap and a handle only or as an adjustable length version. An all purpose utility lead designed for those in between situations. This thirty inch (30") tiny giant packs a punch. Can be configured as a slip lead with handle, a noose, a figure 8, a tie out or a simple walking lead. 5/8 inch x 30 inches, also available in poly. 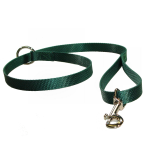 A durable nylon lead featuring a nickle plated swivel snap on both ends and a nickle floating ring to make it very easy to secure the dog to a tree or post.